If I don’t have a slow cooker, how long would you recommend simmering on the stove top or baking in the oven? Thanks! Your recipes look mighty tasty! I can’t wait to try them out. Thanks for the great recipe! I’m assembling right now. I’m wondering, when I cook the pack in the slow cooker, are the pork chops on the bottom of the slow cooker or on the top? Why do I often see (so much) sugar in your recipes? Is it just for taste or preservation? I’d rather not have it. Just curious since you do not have much liquid in these recipes, does the meat tend to dry out when cooking for so long in the crock pot? Slow cookers in general tend to hold the liquid that cooks out of the food, rather than evaporating it. There’s very little venting, if one is disciplined in leaving the lid on for most of the cooking time. You can add some broth or water if you’re worried, or if you see that it’s dry in there. I know my crock pot tends to cook hot, even on low, so if the meat is lean and there isn’t much in the way of vegetables to generate liquid, I will add some broth or water, and I start checking before it’s supposed to be done. Thank you very much for sharing this recipe. I have a son with multiple life-threatening food allergies, and many of your gluten free recipes are safe for him. I look forward to making this dish. Just ate this for dinner on our journey through the Costco plan. Tasted great, we cooked it the whole 8 hrs on low. Meat wasn’t dry, my 2 yr old ate it up. Four pork chops is a bit much for a single dinner. Then again it’s just me, my wife, and 2 yr old. We are going to cook some veggies and eat the other two pork chops tomorrow. This is only the second recipe of the plan we tried and so far both were excellent. Looking forward to the others. I made this today and it was delicious! My husband loved it too! I didn’t freeze it I made it from fresh ingredients, as I am trying a few of the recipes before I commit to them. From fresh I think the apples get a bit overdone but it was still really tasty. I also carmelized the onions before adding them because I think carmelized onions impart more flavor and I added a bit of cinnamon and cumin for even more flavor. I’ll definitely be making a few freezer packs of this one! I made this today from fresh, not frozen. I put the sweet potatoes on the bottom, chicken (we don’t eat pork) in the middle, and onions and apples (tossed in the sugar and balsamic vinegar) on top. It was delicious. Everyone loved the smell, even before we ate it. I will certainly make it again. Thanks for posting it. Can you assemble the meal in a slow cooker bag and then put that bag in a freezer bag? Check and make sure the slow cooker bags are freezer safe and you should be able to if they are. I am trying this recipe today. 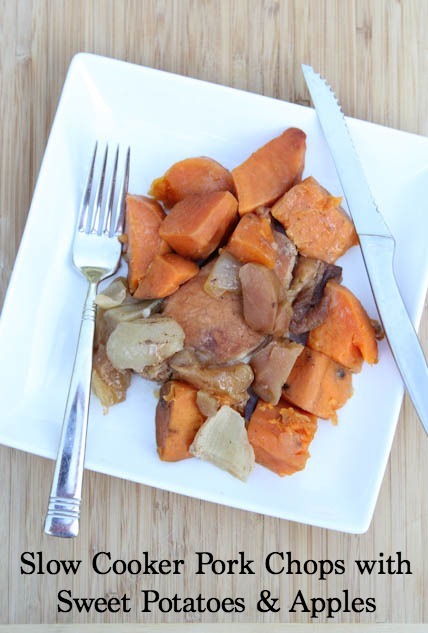 I layered the items like Jill above stated: sweet potatoes, pork chops, apples, onions. I added a 1/4 t ground cinnamon and used Bourbon instead of Balsamic Vinegar, because my husband especially likes another pork chop recipe containing apples and bourbon. I’ve been wanting to try some of your freezer pack recipes, but I have a question. I’ve always heard that vegetables/fruits need to be blanched before freezing to avoid development of enzymes that kill flavor and cause discoloration. However, your recipes seem to put the vegetables in the freezer raw. Does it make any difference in the final product? I wish I read your comment before putting everything together. I made this tonight for dinner but did not like the flavor profile at all. I like all of the ingredients listed so I thought this would be a successful dish but I was left with mushy apples and flavorless sweet potatoes. The pork cooked nicely in the slow cooker but the juices were very acidic. I’m upset this didn’t work out for my family. Oh well, maybe another recipe will prove to be better! My hubby raved about how delicious and flavorful the pork chops were. I used some raw, local honey instead of the sugar. My potatoes didn’t cook all the way, though. They were still a bit hard. Perhaps if I had stirred everything to make sure they were submerged that would have helped. I cooked it for 8 or 10 hours, on low, partially thawed. I think I’ll cut the sweet potatoes smaller next time. Good recipes, thanks! Would you recommend bone-in or boneless pork chops? Thanks!